In a recent interview with David Brody of CBN, Republican National Convention Chairman Reince Priebus sought to quell concerns that the Republican Party might be shifting away from its core principles regarding life and marriage. During the interview, Brody asked Priebus what he would tell people who are concerned that the party might be becoming more tolerant of socially acceptable behaviors. The chairman said that evangelicals have nothing to worry about, and explained that he does not particularly like to use the word “tolerance” because it has taken on a distorted meaning in today’s day and age. 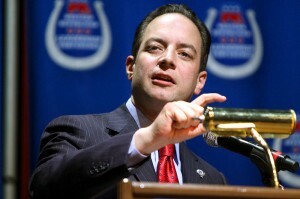 “I get that; I think our party gets that, and there’s never been a movement away from that,” Preibus added. The chairman is stated to be Greek Orthodox in religion. While Preibus asserted that the Republican Party still stands for Biblical marriage, reports have also been circulating over the past year about various state and federal legislators that have chosen a contrary stance. Currently, there are four Republican U.S. Congressmen who have come out in support of homosexual “marriage:” Senator Mark Kirk of Illinois, Senator Rob Portman of Ohio, Representative Ileana Ros-Lehtinen of Florida and Representative Richard Hanna of New York. However, as previously reported, other Republican legislators are working to ensure that the party does not turn away from God. This past weekend, Senators Ted Cruz of Texas and Rand Paul of Kentucky spoke at the Iowa Renewal Project, which attracted approximately 600 pastors.